Dynamic TVS (Thermal Viability Shell) is a reservoir souring emulator that can determine if, when and to what extent a reservoir will sour. The oilfield predictive software model has been developed over many years and uses operational, planning and survey data to generate future profiles of hydrogen sulfide (H2S) in all phases under any temperature and pressure conditions. 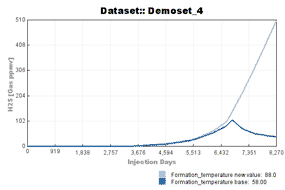 Rawwater reservoir modelling bioreactor studies are constantly being used to feed back into Dynamic TVS making it the industry standard for hydrogen sulfide (H2S) forecasting in oilfield reservoirs. Rawwater offers workshops and training courses for clients on oilfield souring control and the use of our forecasting software and the application of forecasting results. These forecasts can then be tested using our pressurised bioreactors and our existing bioreactor database. Rawwater can provide access to a fixed-input TVS demonstration. If you are interested in the Dynamic TVS service, please contact us. 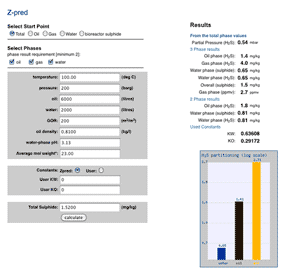 Z-Pred is Rawwater's sulfide partitioning calculator. It calculates equilibrium sulfide concentrations in aqueous, oil and gas phases for any temperature, pressure and water chemistry. It is essential for understanding the severity of oilfield reservoir souring. The software also forms part of the modules used in Dynamic TVS. The Dynamic TVS software can predict a reservoir's propensity to sour in advance of well completion. Once the base trace is established, a real-time sensitivities processor is used to examine the effects of changes in multiple parameters. Rawwater has conducted a large number of reservoir forecasts on fields in North Sea, Gulf of Mexico, Africa and Nigeria. Z-Pred provides calculation of the partitioning of hydrogen sulfide in all wellstream fluid phases for both two-phase and three-phase systems under defined downhole and topside conditions.